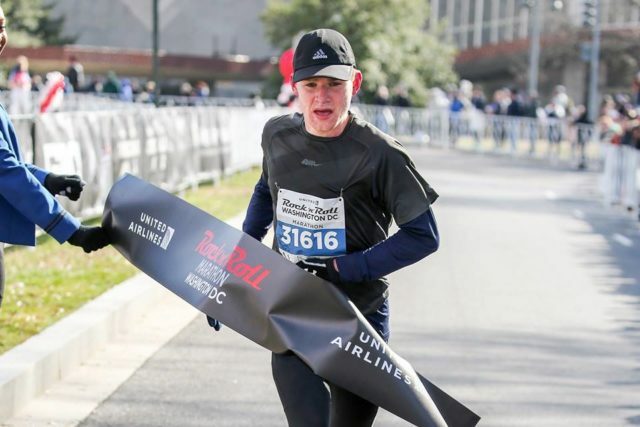 Sam Doud breaks the tape at the Rock ‘n’ Roll D.C. Marathon. Photo: courtesy of Rock ‘n’ Roll Marathon. For a year and a half, Sam Doud didn’t race. After he walked away from collegiate running at American University, he just logged his miles, enjoyed the sport and bided his time until he was ready to race truly long distances. March 11, 2017 – Washington, D.C. In February, he started getting itch to see what he could do — he was running fast and ready for the challenge. The Rock ‘n’ Roll D.C. Marathon started a few miles away from his Glover Park home, what better place to see what he could do? Ended up being a good move. In winning the race Saturday morning, he blazed the fastest time (2:26:57) since the course was beefed up two years prior, and left two solid marathoners in his wake in 2013 Marine Corps Marathon Champion Girma Bedada and six-time Rock ‘n’ Roll/National Marathon winner Michael Wardian. Doud, 21, showed up with his roommate and put on his bib — number 31616 — and saw Wardian (bib number 1) and Bedada (bib number 2) near the starting line. But he ended up catching them both, running with Wardian between miles 11 and 17, then reeling in Bedada with a mile and a half to go before putting three minutes on him. Though the back half of the race is always lonely, marathoners usually have the half runners to keep them company through 12 miles. This year the marathoners started an hour and a half before the half. With Metro’s Safetrack restrictions keeping race organizers from opening the system early, they started marathoners early and allowed the more than 13,000 half runners take the trains into the city. The marathon’s 2,373 finishers were on their own to get to the start. That meant empty streets for Doud and his competitors, with few spectators braving the cold, though he got a boost from passing the statue of Simón Bolívar near the first mile mark. When Doud crammed for the race with a few marathon-pace workouts, he targeted 5:50 miles. On race day, he averaged 5:36 per mile, and only his cautious first mile was slower than his initial goal pace. “This has me wondering what I could do if I seriously train for a marathon,” he said a day after the race. Despite his early success, he has a lot to learn. For instance, Wardian remarked to him after the race that he hadn’t seen Doud eat anything during the race. “I told him I didn’t see any food,” he said, at the time unaware of the bevy of running gels and calorie-replacement options available to runners, including at one water stop. Still, he never hit the wall, and felt comfortable throughout the race, even in the latter stages. He remarked that the climbs around Fort Dupont Park were far more difficult than out of Rock Creek Park on Shoreham Drive. Doud, a Bloomington, Ill. native, has less than a year until he graduates with majors in math and computer science, and is tossing around the possibility of running the Marine Corps Marathon. There, he’ll likely face warmer weather than the mid-20s that greeted him on race morning. On Saturday, he played it safe, wearing extra layers, including two hats, for his first marathon. He took time after the race to find out a little bit more about the marathoning world from Wardian, particularly how he should expect to feel in the morning. And ran 13 miles, a little faster than 7:20 per mile. Christie Wetzel, of Falls Church, won the women’s marathon in 3:04:01, two years after running 3:58 in her first marathon here. She ran the race with her husband, Rodrigo Garcia, pulling ahead of him near the finish. Ithaca, N.Y. resident Sabine Fischer-Daly was second in 3:08:41 and Hyattsville’s Angela Hartman was third in 3:10:07. In the half marathon, Mizael Carrera (Addison, Ill.)1:05:51 defended his 2016 title, Austin Whitelaw (Johnson City, Tenn.) was second in 1:07:59 D.C.’s Paul Thistle, recovered from a long foot injury, was third in 1:08:27. D.C.’s Kerry Allen (1:19:20) won the half after finishing second in 2014 and 2016. This title comes three weeks after she won the Dahlgren Heritage Trail Half Marathon in Virginia. Jenny Mendez Suanca, the 2015 Marine Corps Marathon champion, was second in 1:21:37 and Fairfax’s Sarah Bishop was third in 1:22:02.